Hello there! We continue to develop Reign of Guilds and today we would like to give you a small sneak peak on some visuals. 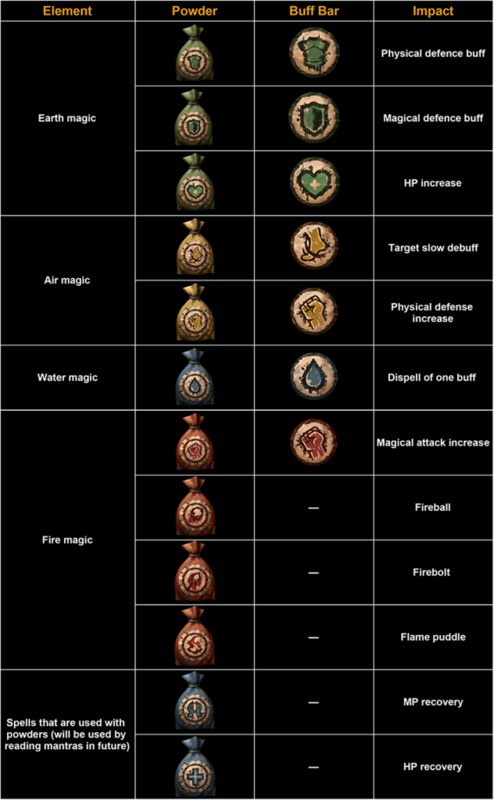 Our art designer have prepared some icons of buffs and magic that is presented with powders. And we are to show you some of them. Upon creation we tried to make their image intuitive, so you can see, for instance, that blue powder is correlated with water magic, red one - with fire and so on. Please note that you can check out part of icons and test them in our new content update №6 that will be implemented into the server soon. We also want to point out HP and MP recovery magic. At the moment this kind of sorcery is displayed via relative powders, so we’ve made special icons for them. But in future, we want to remake them so they could be activated by reading mantras from special books. Despite that, some of classes (Druid, for instance) will be able to use powders in order to recover health. Don’t forget to check out our first ROG development blog. There you will find plenty of info about modeling, level design, VFX and lots of more development aspects of ROG. Didn’t have time to check out our working prototype? No worries, simply write a note on our forum to get free invite for testing!